Sounds like she's going to be okay! Has a great attitude! What, if anything, will happen to the beautiful beastie? Thanks Cher! Good for him!!! Thanks Cher! 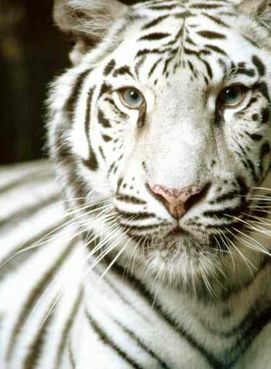 OK...after reading the news...gotta say YIPPE FOR THE WHITE TIGER. The tiger did what is instinct. A caged tiger is not a happy tiger too. i like her attitude.she said nothing against the tiger,and that makes her cool in my books.also she wants to go back there to work! thank you Cher. I am glad that Frau Gruhn said nothing against the tiger. Wild animals will be wild animals! I am also glad her colleagues did nothing against the cat. i`m glad she`s ok,and wanting to carry on with her work at the zoo. I'm glad she's going to be OK, and I hope there are no other opportunities that might get the tiger killed next time. Tigers don't belong behind bars and she's lucky to be alive considering his frustration. How great to learn that the zoo keeper feels this remains her 'dream job'. These are WILD animals that retain their natural instincts and belong in their natural habitat and not encarcerated in zoos for people to gawk at them until they die. When an animal as this acts according to instinct, we always seem to root for the human as oftentimes the true victim which is the animal is shot or killed in some fashion. Not me. I am completely anti-zoo as well as against animals in entertainment. Incidents as this one should open everyone's eyes as to why this is wrong. Well, working in a zoo wouldn't be MY dream job ! I'd feel WAY too guilty ! As if all the animals HATED me for keeping them captive ! :) Anyway , it's a miracle she wasn't killed. Glad she didn't blame the tiger ! Thanks for posting! This is an excellent reason to point something out. Exotic animals do not make good pets. I feel bad for any zoo animal of course, but at least most zoos are trying to save these animals through breeding and release in some cases.